In many ways, Vietnam caused a great deal of pain and hardship. It also resulted in the creation of unbreakable bonds forged by those banded together to not only fight the war, but to survive it as well. In “The Vicissitudes of Fortune” by Bob Siqveland, five young men are brought together and form a tie amongst them that lasts a lifetime. These men come from a wide range of cultural and socio economic backgrounds. These include Japanese, Native American, Jewish, African American and Caucasian. While this combination might be unlikely to form a group in civilian life, the experience of being young men in war makes them a family. In fact, some of them have better relationships with each other than their own blood. It is also interesting to note that as a whole, their individual strengths helped to overcome their weaknesses. “The Vicissitudes of Fortune” tells their stories. Author Bob Siqveland does a masterful job of tying real history in to this fictional story. I found myself looking up historical people and events that were mentioned, to assuage my curiosity about what I was reading. In addition to enjoying a great fictional novel, I also learned a great deal about the Vietnam era and other historical events, including the WWII internment camps, the Selma to Montgomery March, and life on the Pine Ridge reservation. The author also takes us back and forth through each character’s life, from their childhoods through to their adulthood, along with information about their parents and their experiences. These details add greatly to the character development which enables the reader to better understand their choices. Siqveland manages to weave us through time without making it confusing. He not only has a great talent for doing this, but also changing the narration from first person to third without the story losing a beat. 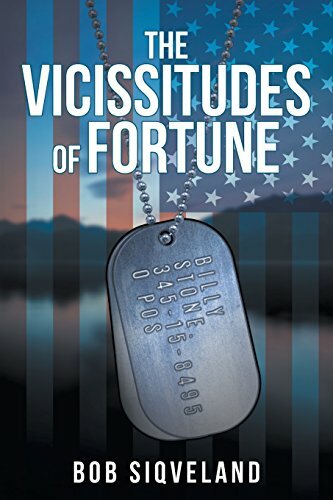 I really enjoyed reading “The Vicissitudes of Fortune” by Bob Siqveland. The characters seemed so real to me, I felt like I was experiencing their lives in person rather than through the pages of a book. Readers who enjoy historical fiction will really enjoy this novel, especially those with an interest in the Vietnam era. This book would be a great selection for a reader’s group or a high school summer reading list.